Kelly Stott applied for the WDH Foundation Grant to cover the cost of a Phlebotomy course as she had previous experience within the care sector and was keen to progress her career and better her future both for herself and her family. 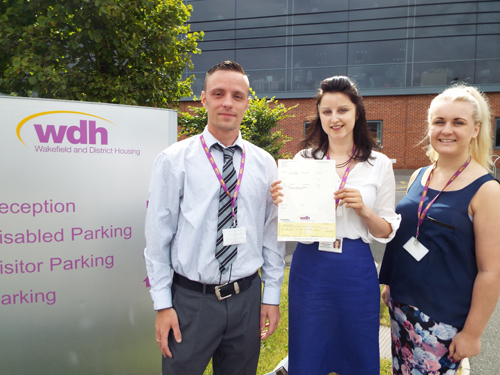 WDH gave Kelly support to complete the Foundation Grant application form as she struggles with dyslexia. She carried out her own research beforehand and found a training provider who could meet her learning needs, but she couldn't afford the cost of the course independently. Phlebotomists are people trained to draw blood from a patient for clinical or medical testing, transfusions, donations, or research. The two-day Phlebotomy course took place in York and consisted of both exams and practical sessions including how to take blood, needle stick injuries and infection control. She successfully passed all of her assessments with a 100% pass mark and received really positive feedback from the tutor about her approach and her commitment. Kelly's next goal is to achieve the further Phlebotomy qualification and gain more experience within the healthcare sector with an updated CV and new qualification she can send out to local employers. WDH’s Community Employment Advisors regularly visit work clubs held across the district. They are skilled professionals who can help WDH tenants to find jobs online, offer guidance on how to write a CV and apply, offer interview skills and tips, and help individuals to find the right training course. They have helped more than 4,500 people so far, assisting over 2,000 into training and over 1,400 into employment.